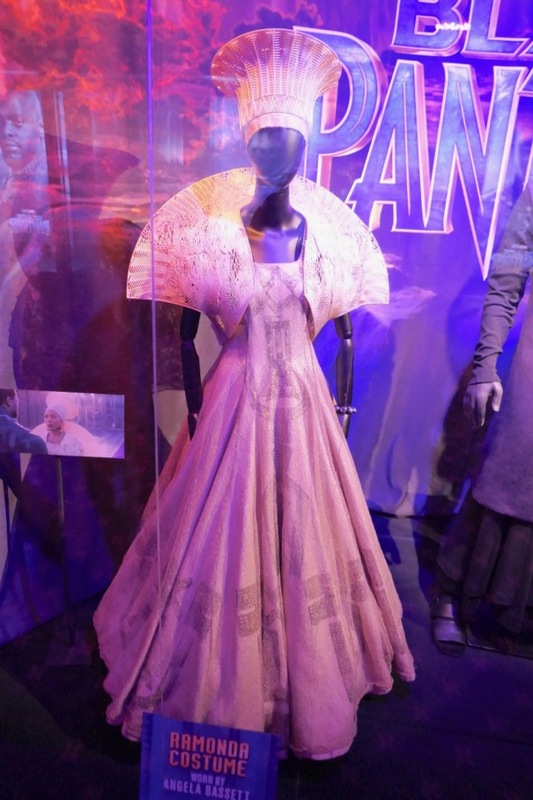 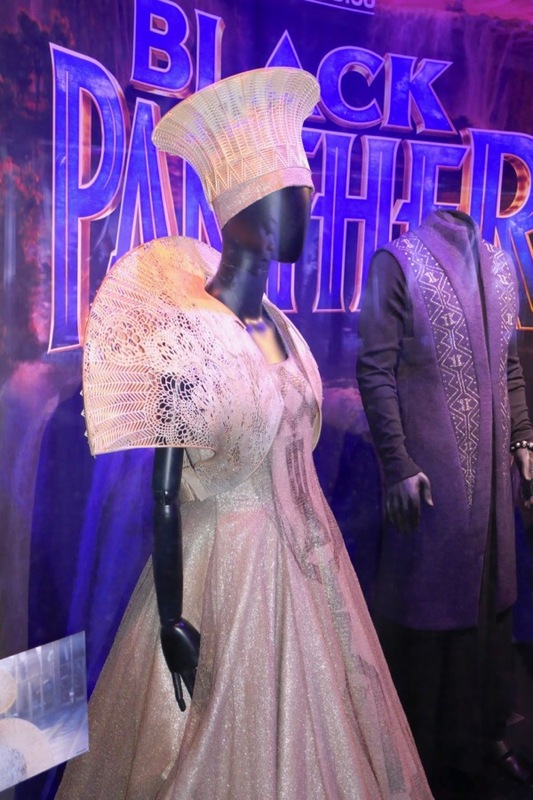 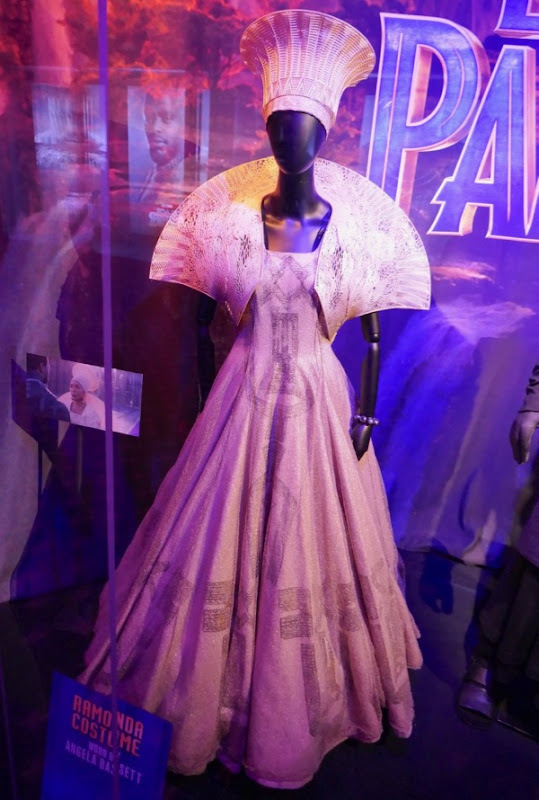 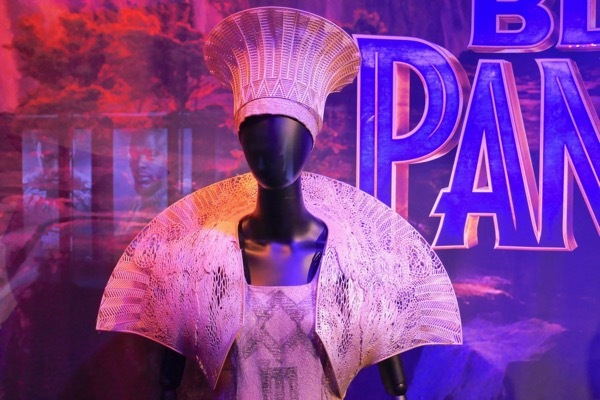 In the Black Panther's first solo movie, 'Queen Mother Ramonda' and his younger sister 'Shuri' wear these ceremonial costumes for 'Prince T'Challa's' coronation to claim the mantle of king at Warrior Falls. 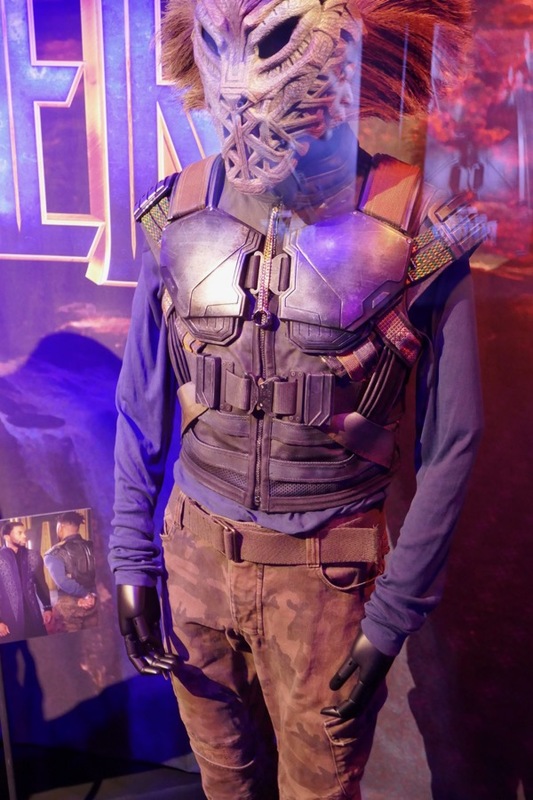 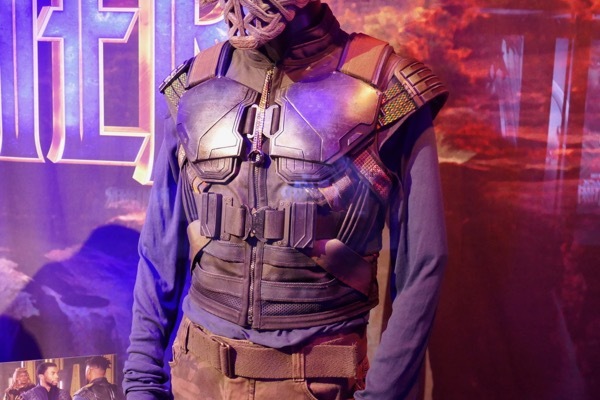 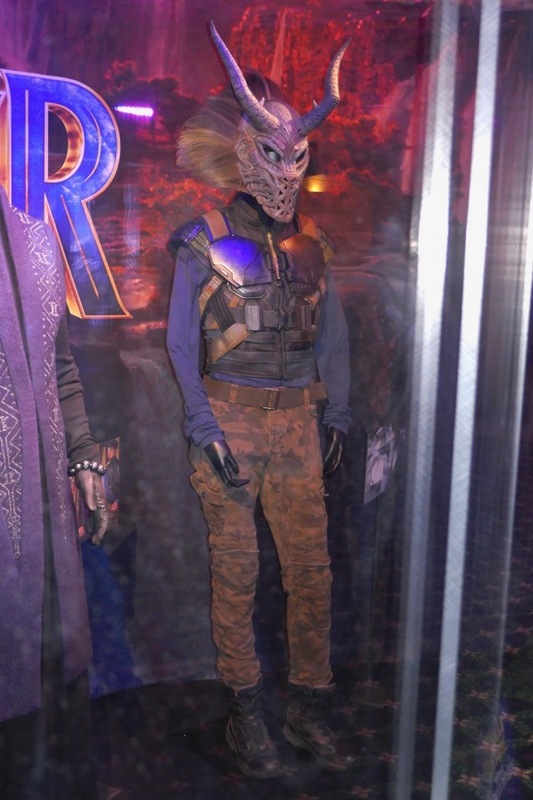 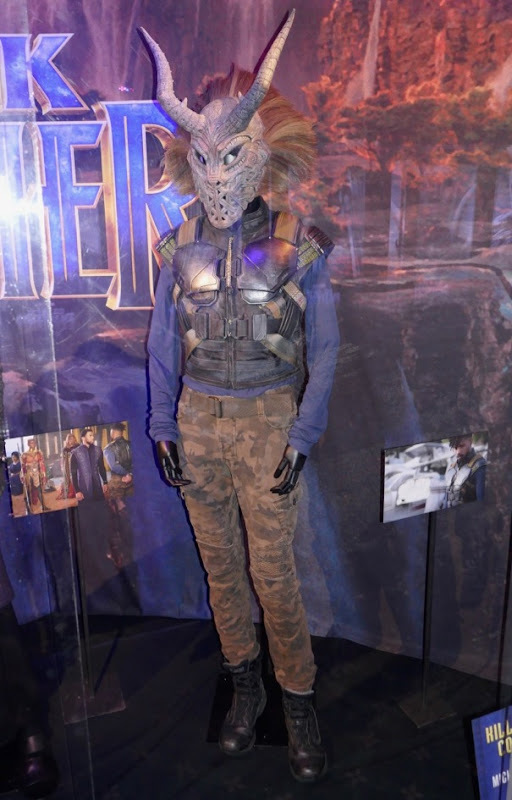 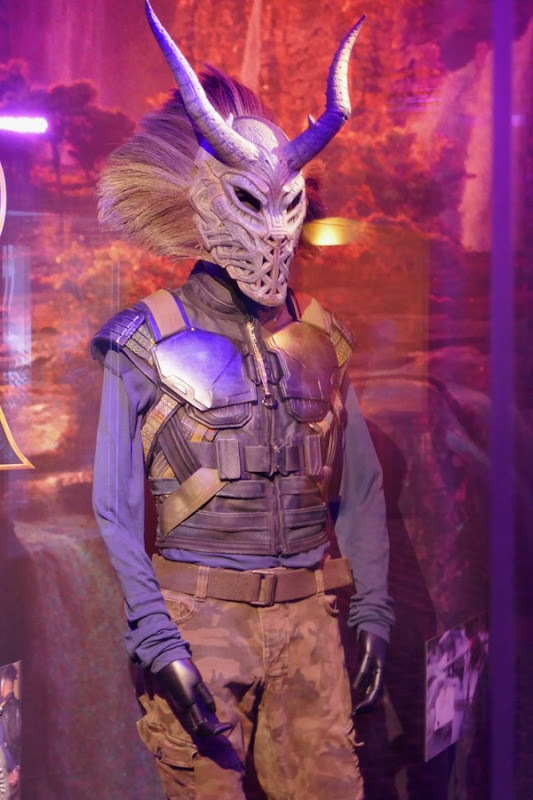 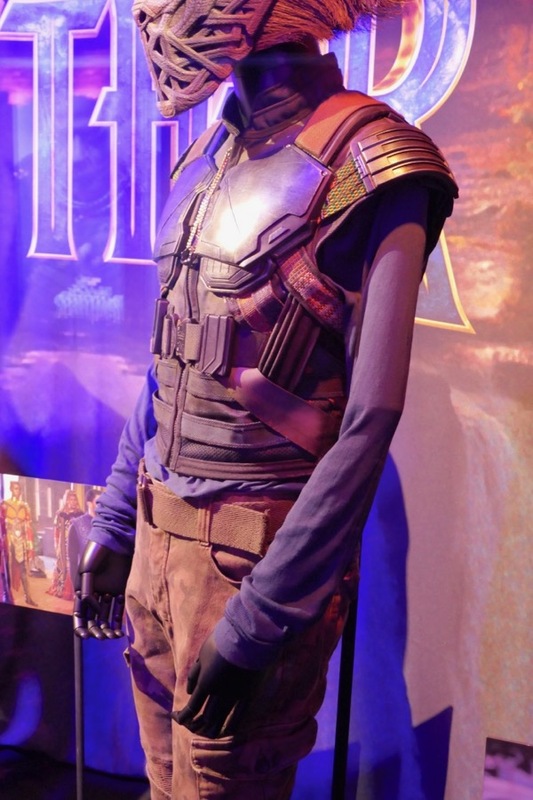 This costume exhibit for the Marvel Studios film was photographed where they were temporarily on display at Hollywood's El Capitan Theatre on February 23, 2018. 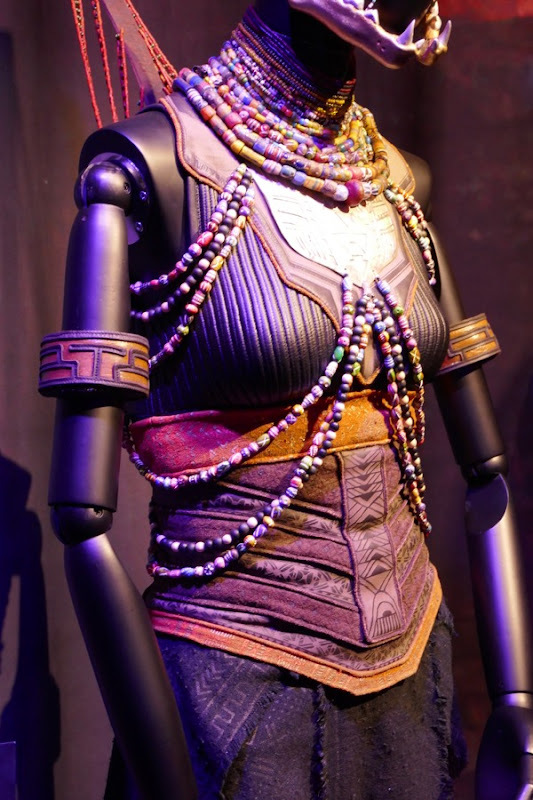 Ruth Carter was Costume Designer on Ryan Coogler's record-breaking hit movie and created her Afrofuturist looks for the nation of Wakanda by referencing many African tribal looks, art, colours and fabrics. 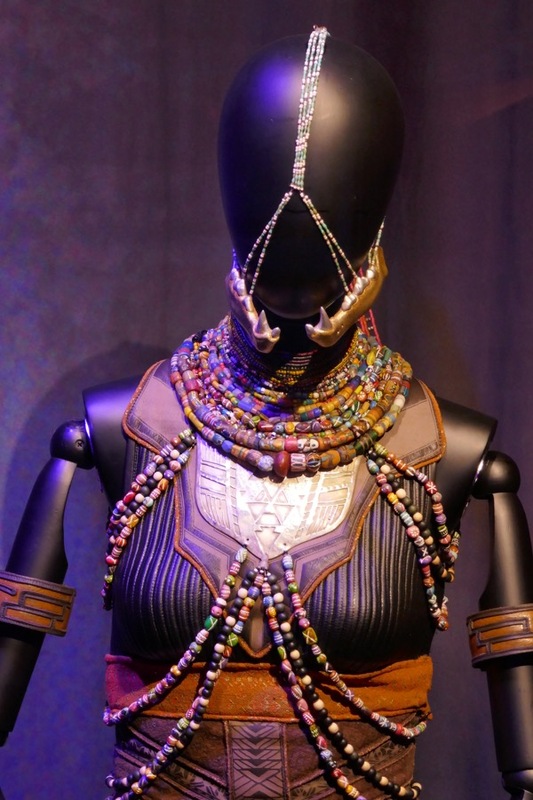 In the movie we discover that not only is the metal Vibranium from the meteorite used in Wakanda's advanced technology, but it is also woven into the very fabric of their clothes. 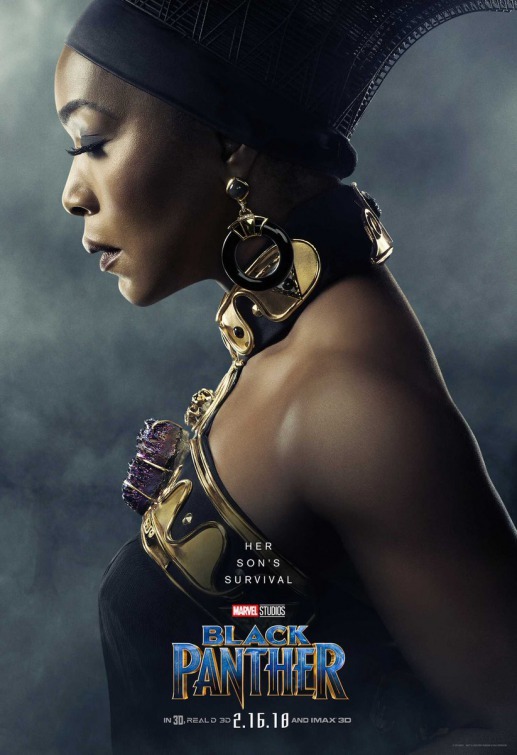 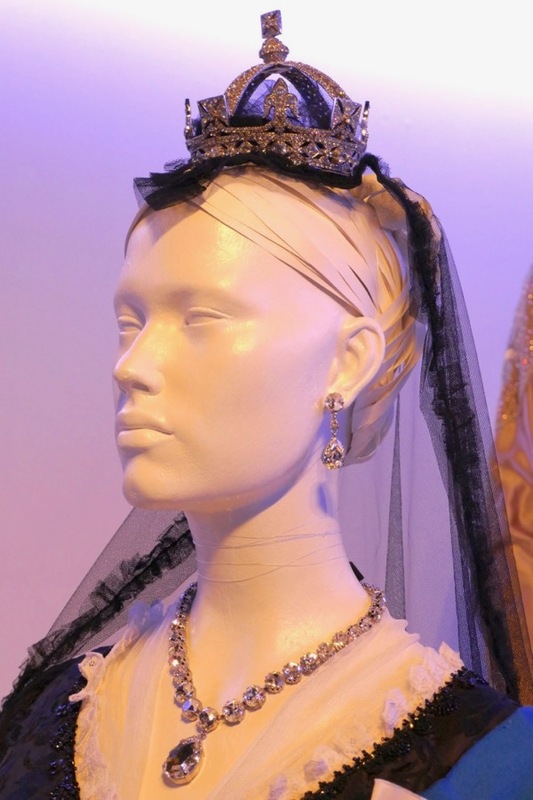 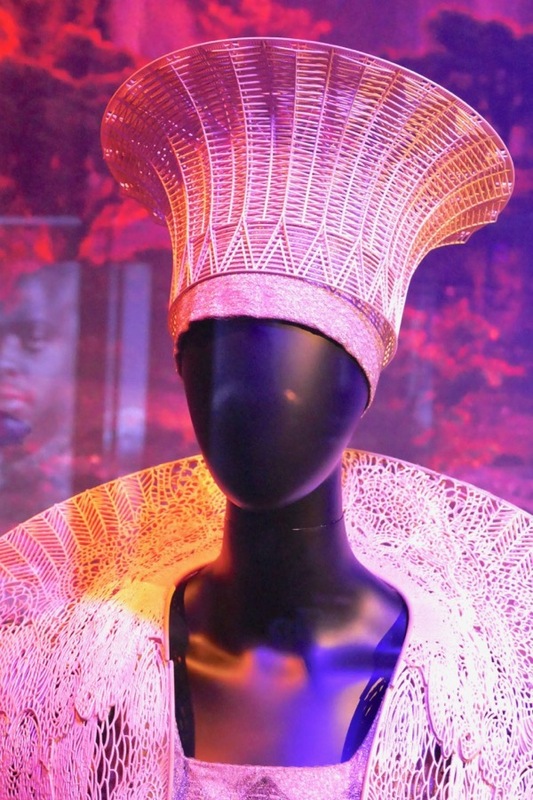 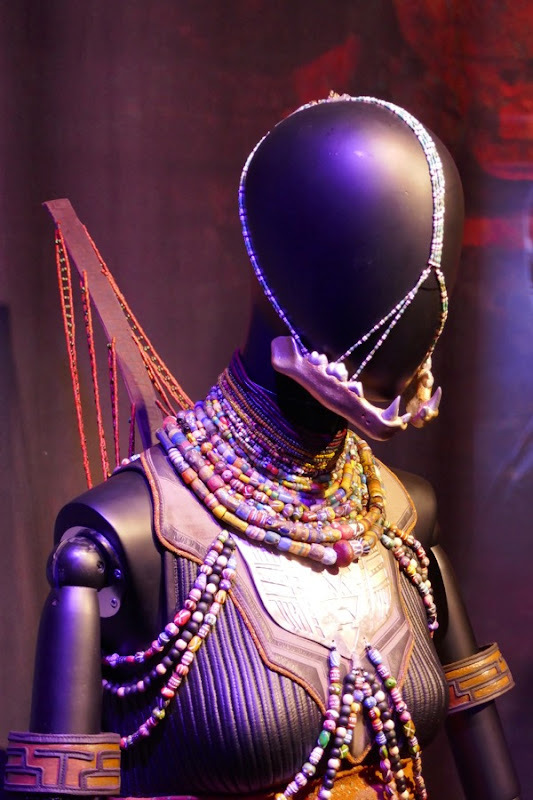 This white costume that Angela Bassett wore for T'Challa's first challenge to his throne featured headwear inspired by South African Zulu tribeswomen and a shoulder mantle based on African lace and inspired by English fashion designer Gareth Pugh, which was created by 3D printing expert Julia Koerner. 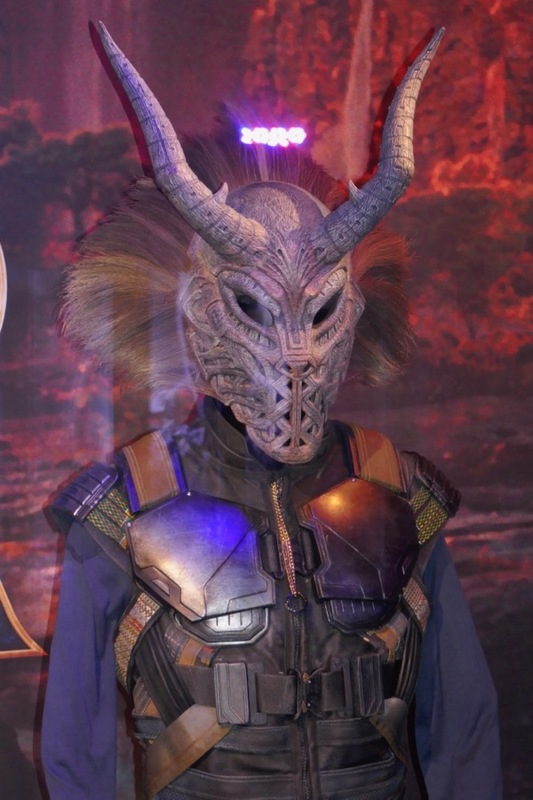 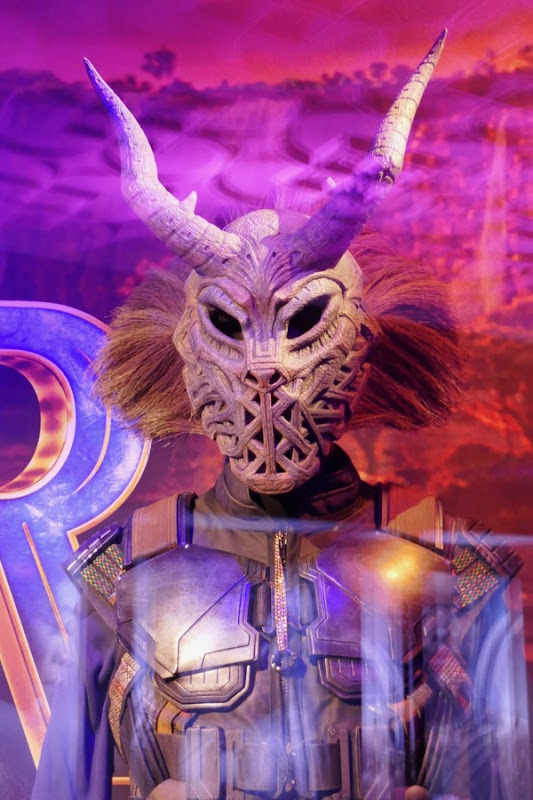 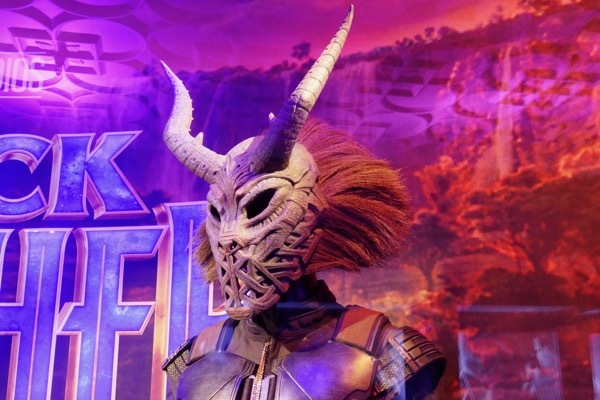 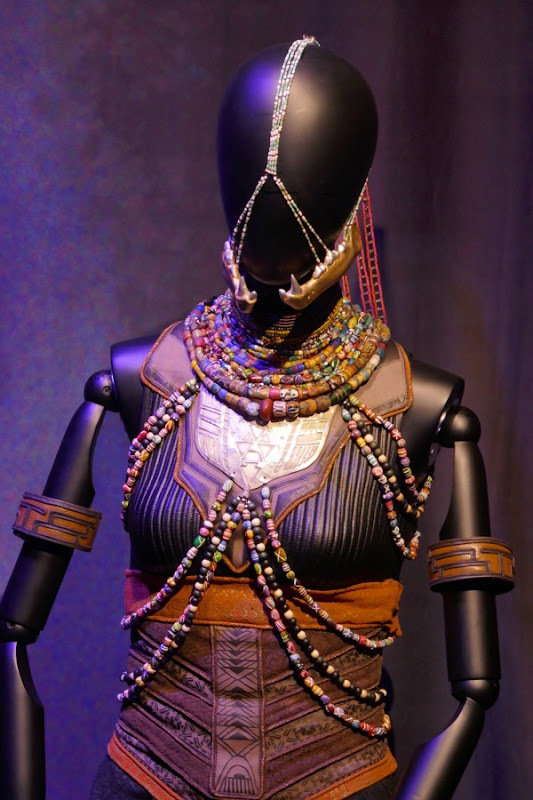 If you like this regal look, you can also check out another darker Ramonda costume from Black Panther on display. 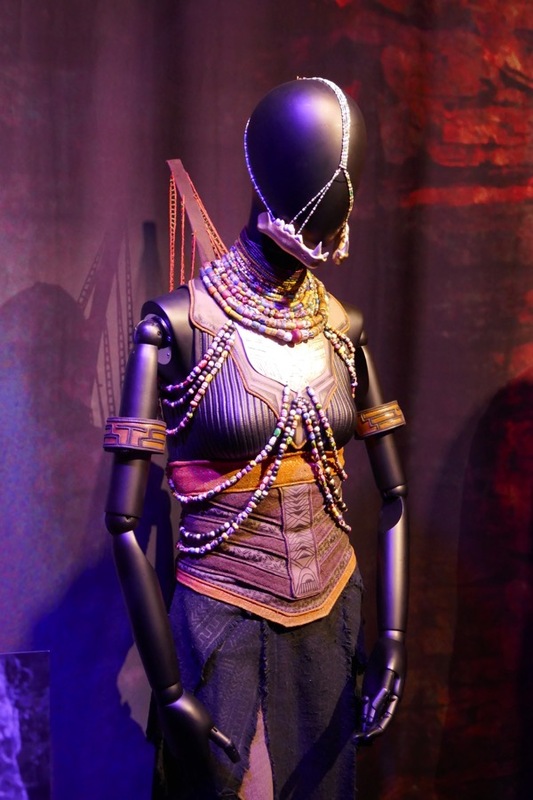 This is the costume Shuri complains she wants to get out of at Warrior Falls as the corset is tight. 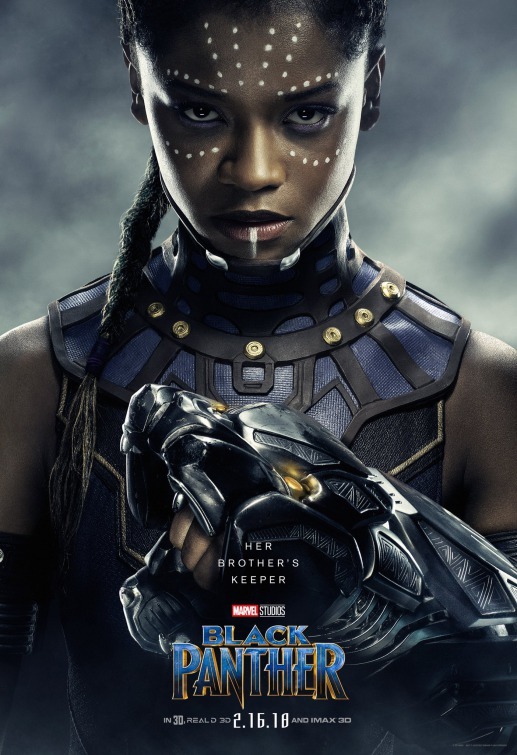 Fans of T'Challa's genius younger sister, the 'Q' to his 'James Bond', who also represents the new Wakanda can also check out this Shuri costume with gauntlets from Black Panther. 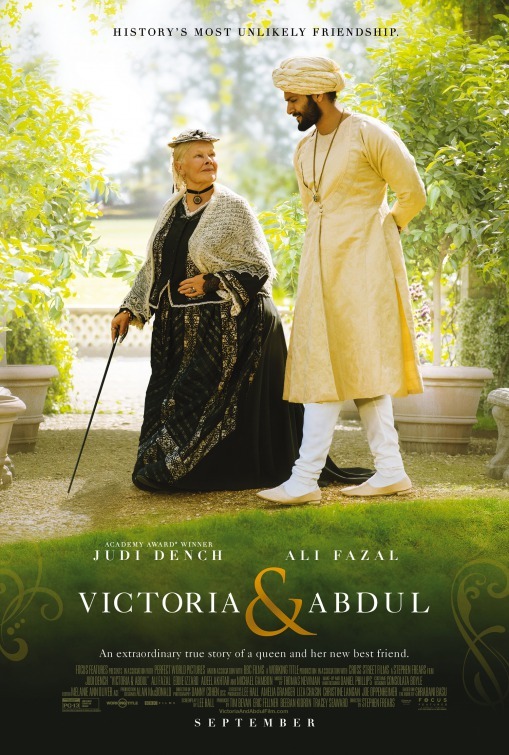 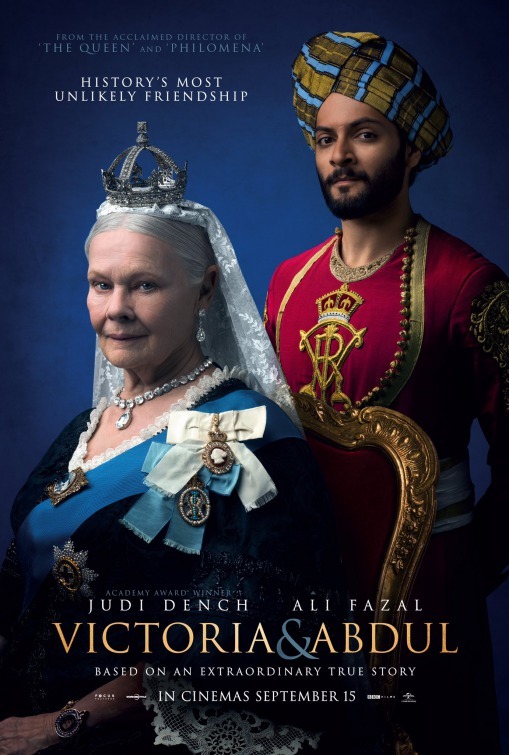 In last year's Victoria & Abdul, Dame Judi Dench reprised her role as the cantankerous 'Queen Victoria' in a true story about an unlikely friendship between the British monarch and her Indian servant and confidant 'Abdul Karim' (played by Ali Fazal). 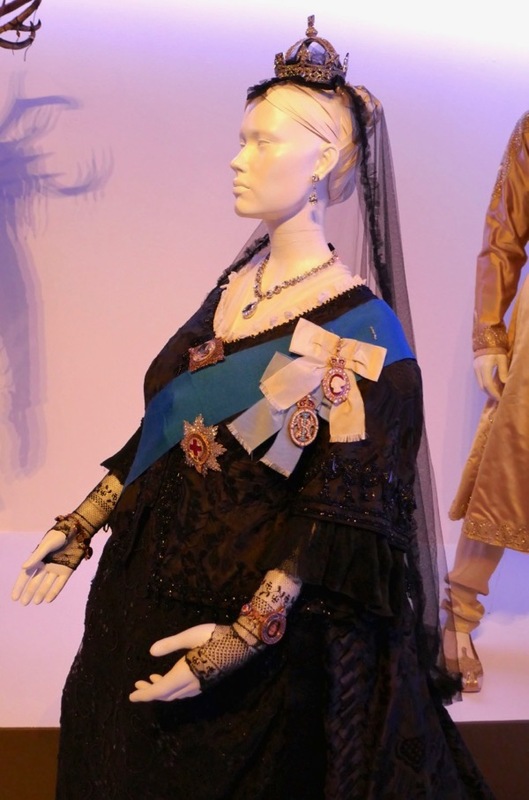 Consolata Boyle's costume designs from Stephen Frears adaptation of Shrabani Basu's 2010 historical book were nominated for an Academy Award. 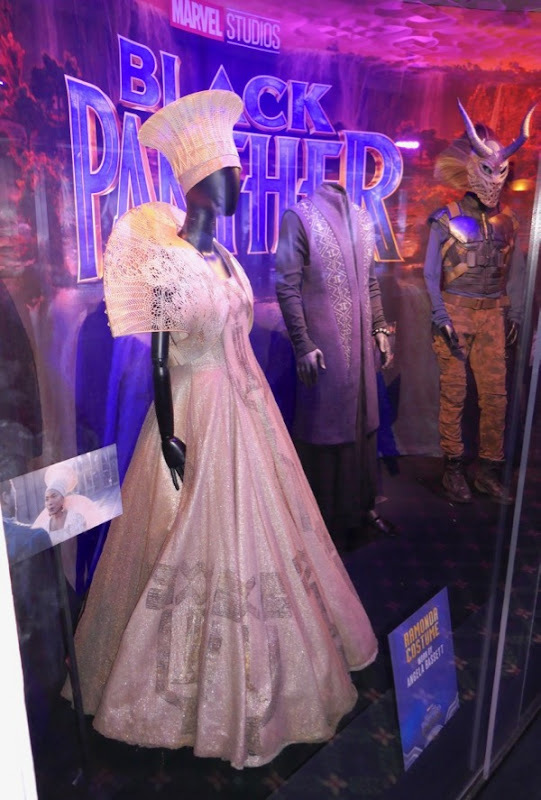 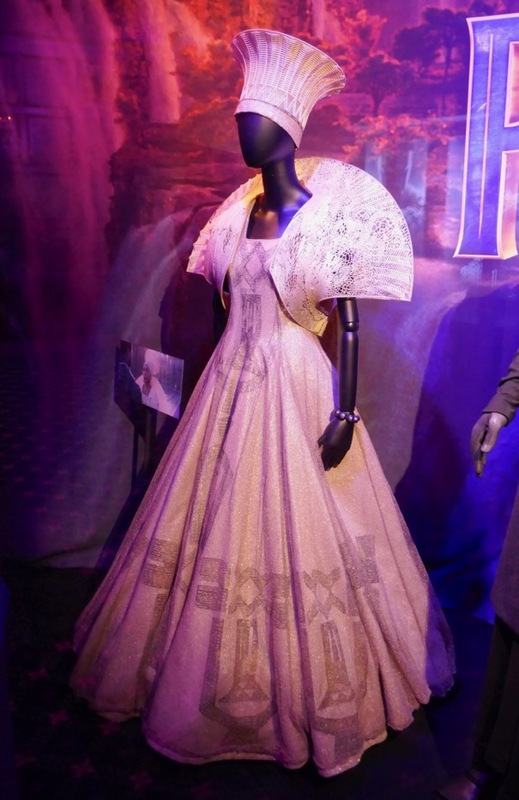 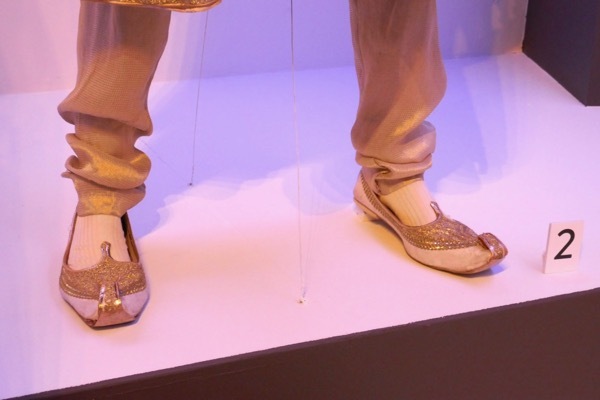 These regal Oscar-nominated costumes were photographed on display at Downtown L.A.'s FIDM Museum on February 7, 2018. 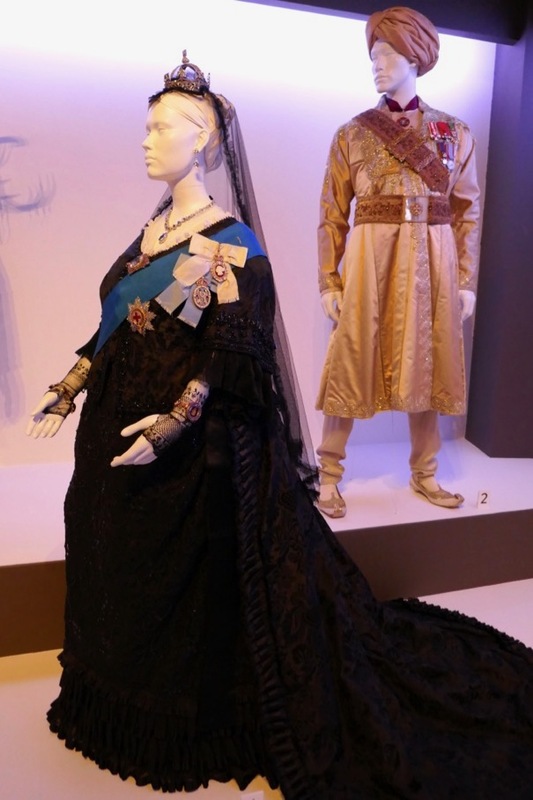 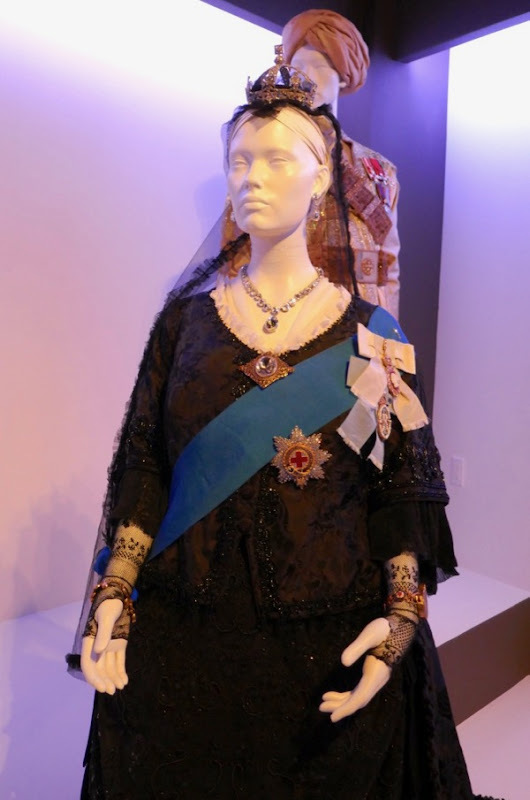 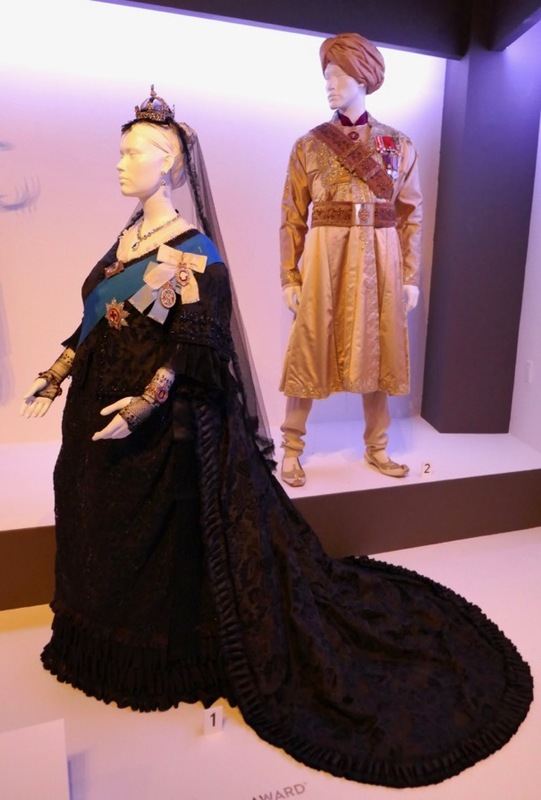 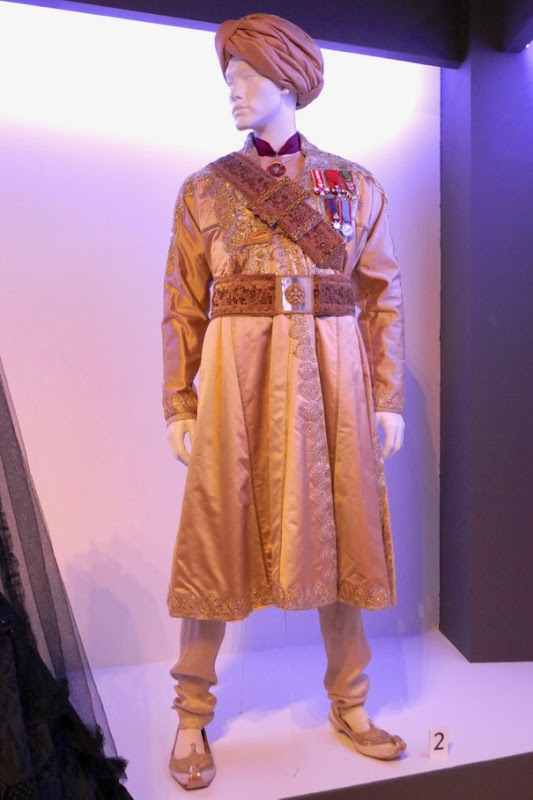 Fans of the movie can also enjoy these additional Scottish Highlands-themed costumes from Victoria & Abdul on display. 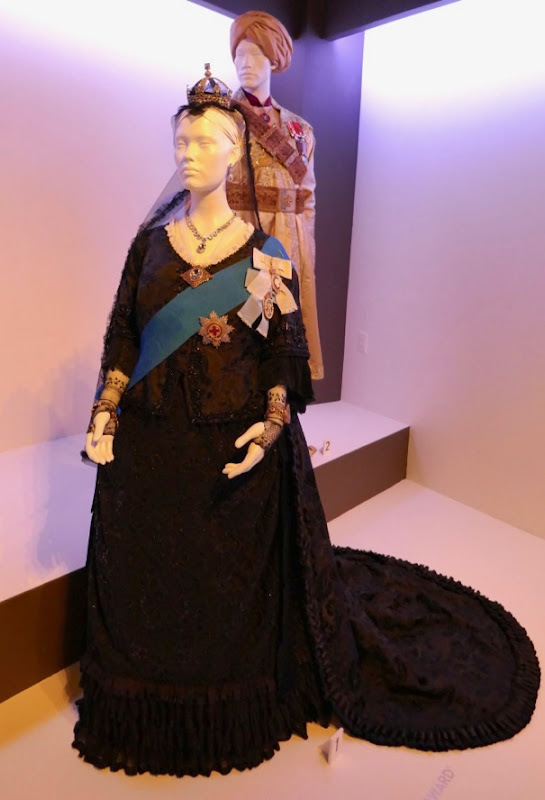 After the death of her husband, 'Prince Albert', at the young age of 42 in 1861, Queen Victoria only wore black for the rest of her reign, in mourning for almost four decades. 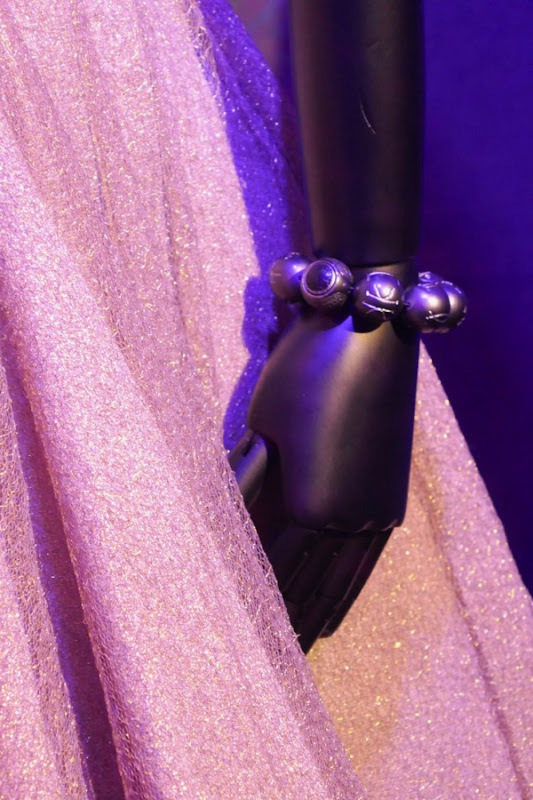 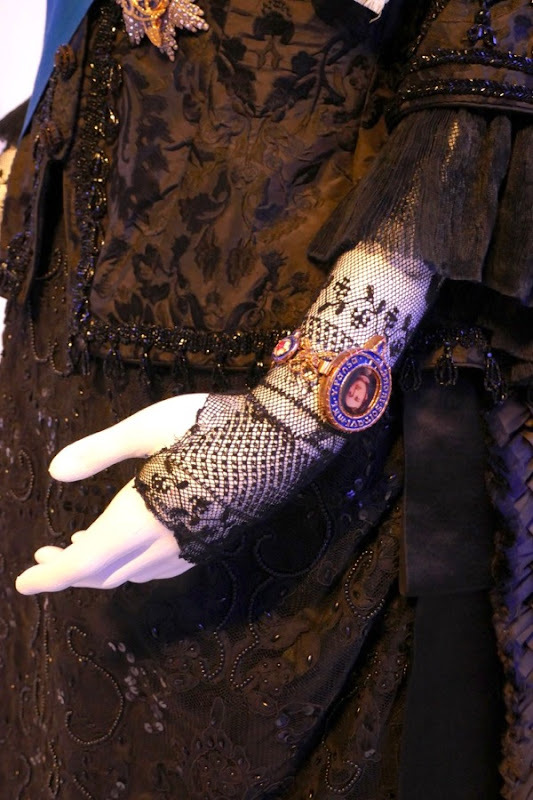 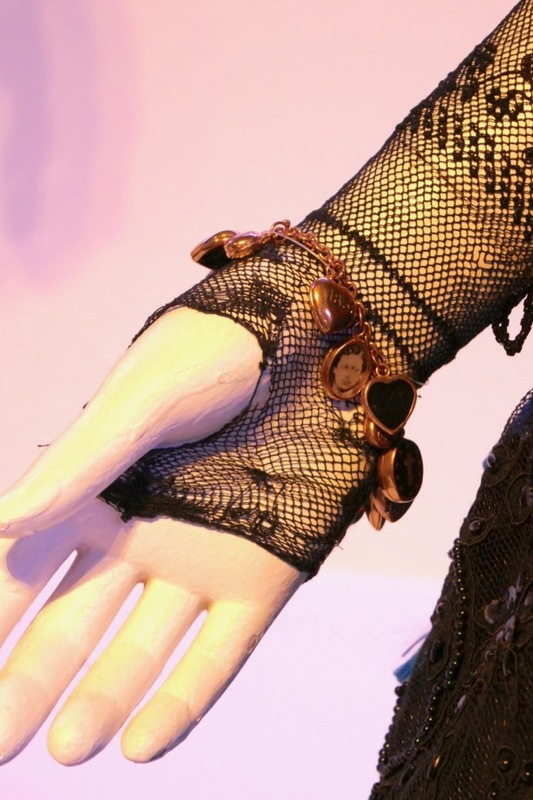 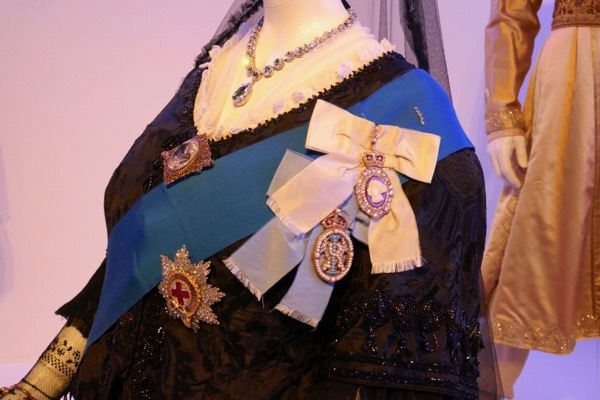 It's amazing the detail that goes into these costumes, most you don't see on the big screen, especially the pictures of Prince Albert on the Queen's bracelets. 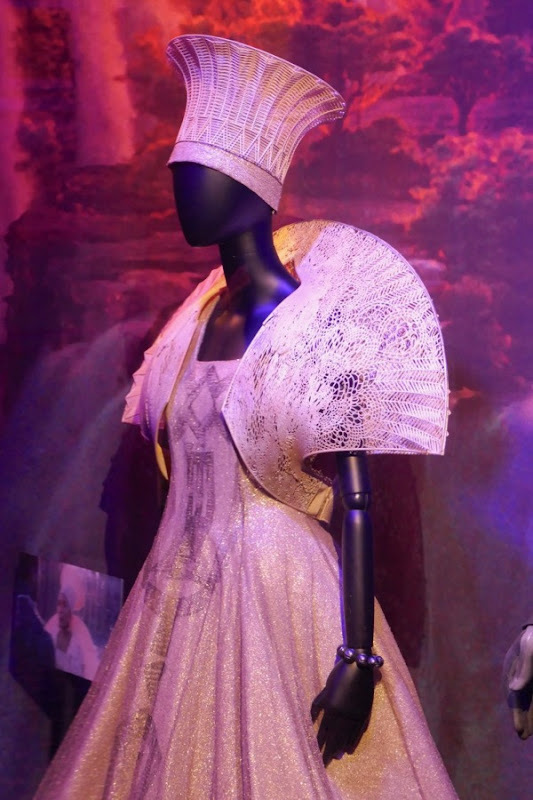 Fans of the actress can also check out her costume from The Best Exotic Marigold Hotel. 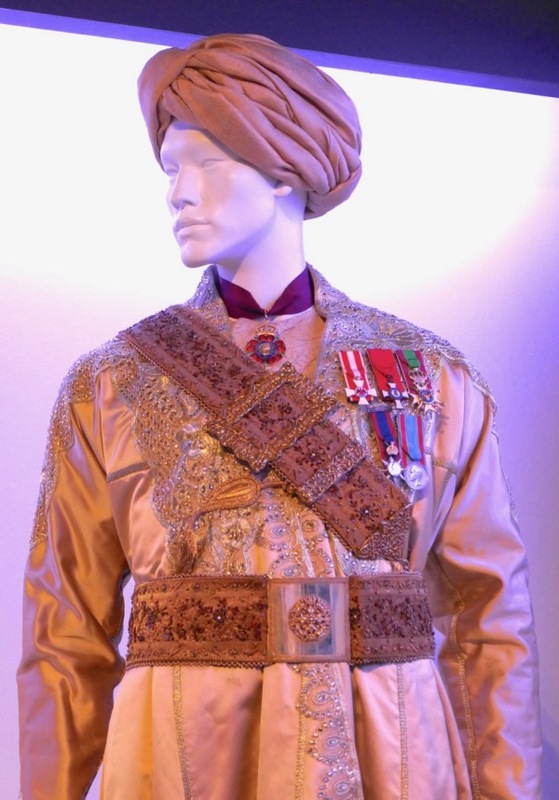 For more Indian-inspired film fashion you can also enjoy these wedding costumes from The Second Best Exotic Marigold Hotel. 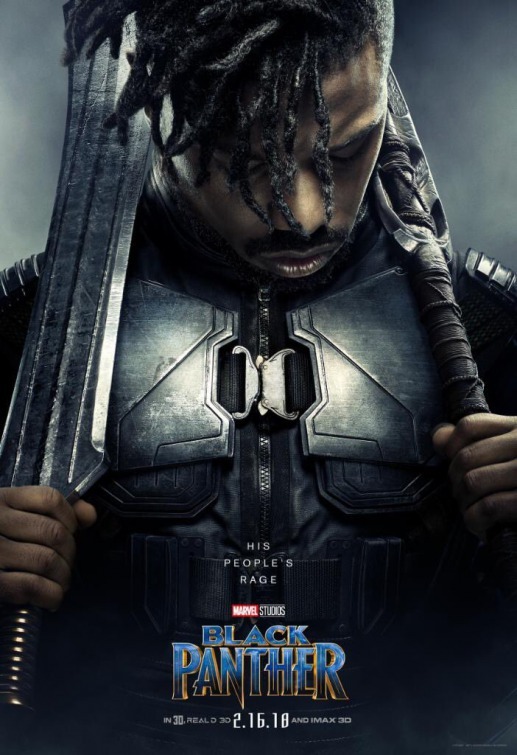 With Michael B. Jordan's 'Erik "Killmonger" Stevens' or 'N'Jadaka' the son of 'N'Jobu' (and cousin of 'King T'Challa') the Marvel Cinematic Universe finally gets a well rounded villain, with clear motivations and purpose. 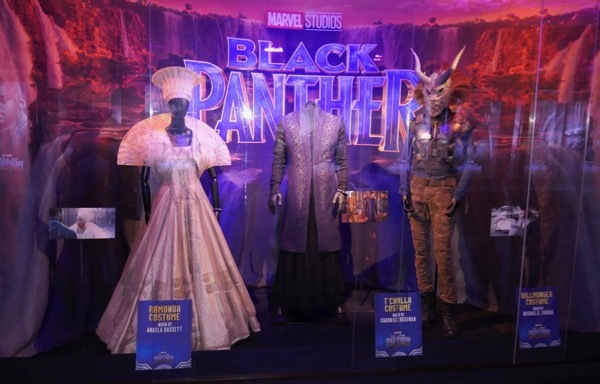 In addition to his family history, this movie version of the Black Panther's arch-enemy was also given a past in which he was trained in black-ops, intent on killing T'Challa and claiming the throne of Wakanda for himself and using its advanced weaponry to takeover the world. 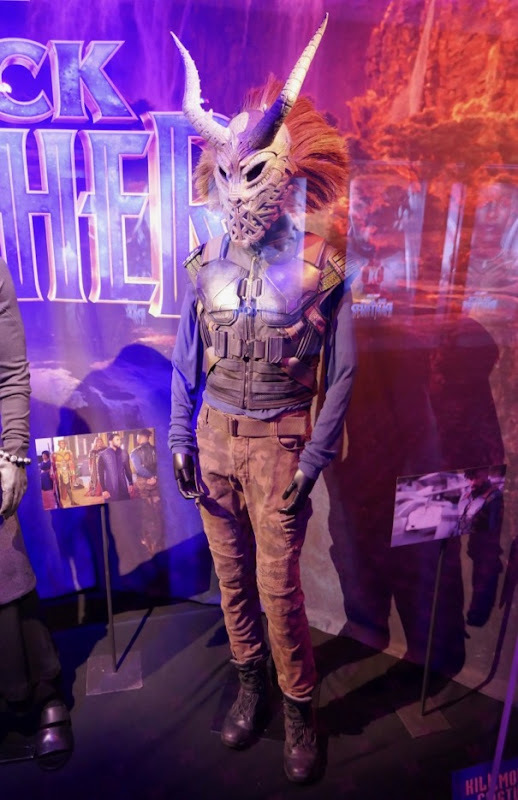 Killmonger obtains his African mask at a heist at a British Museum with 'Ulysses Klaue' when they are stealing Wakandan vibranium which is part of an African historical exhibit, adding it to his military-inspired tactical vest and camo fatigues look. 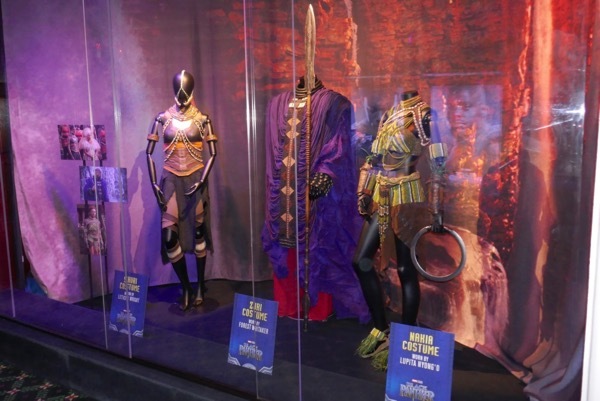 Ruth Carter was Costume Designer on Ryan Coogler's box office juggernaut and you can also check out Killmonger's Black Panther camouflage costume and more wardrobe from the Marvel Studios film on display. 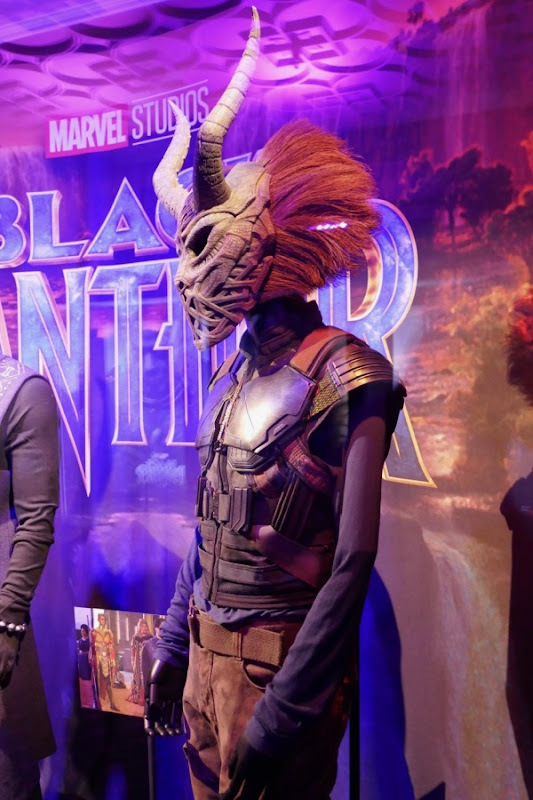 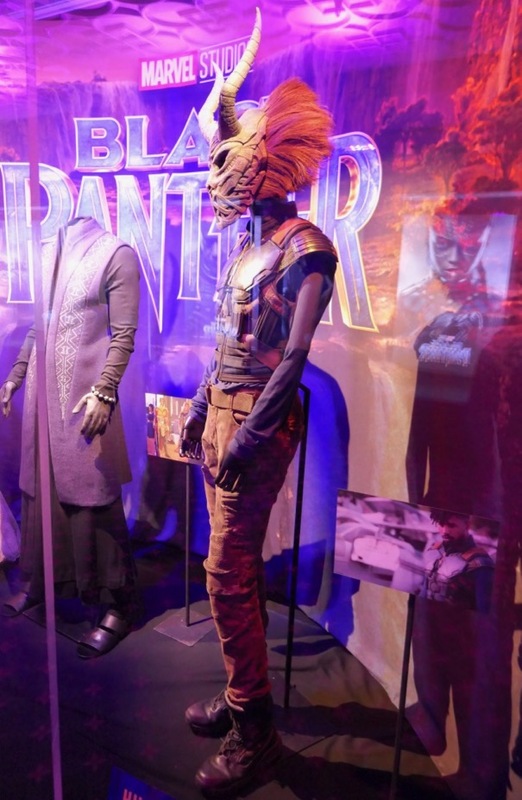 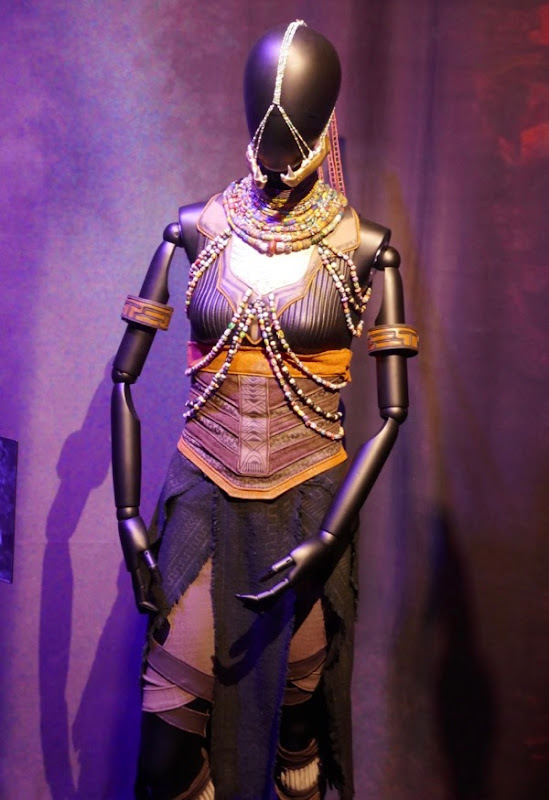 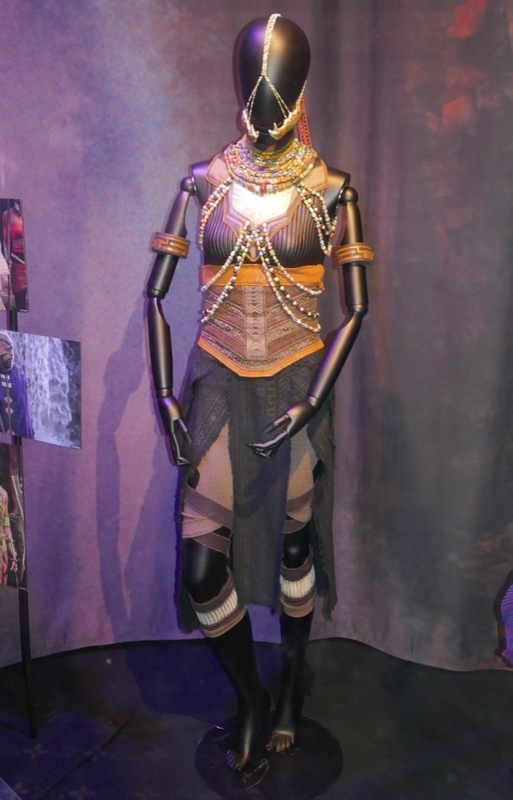 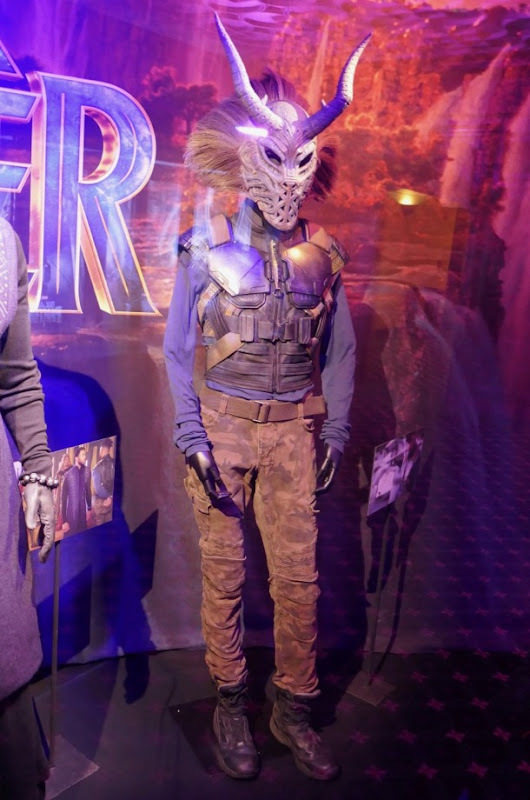 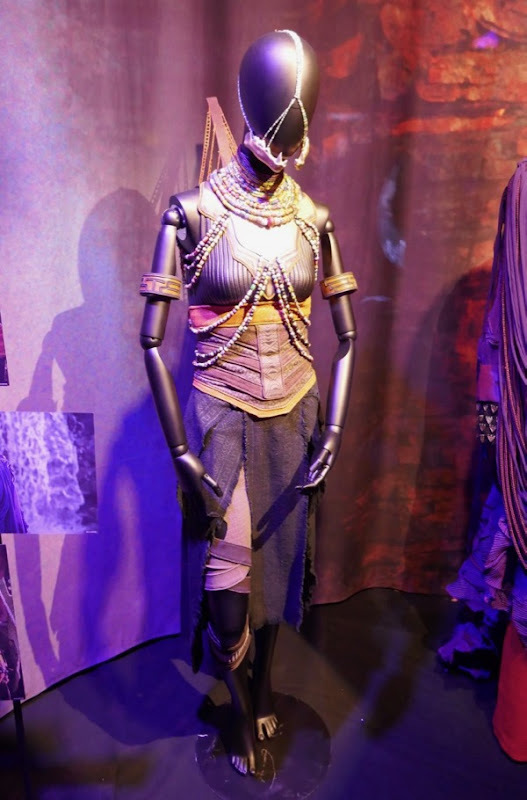 This costume was photographed on display as part of a larger Black Panther costume exhibit at Hollywood's El Capitan Theatre on February 23, 2018. 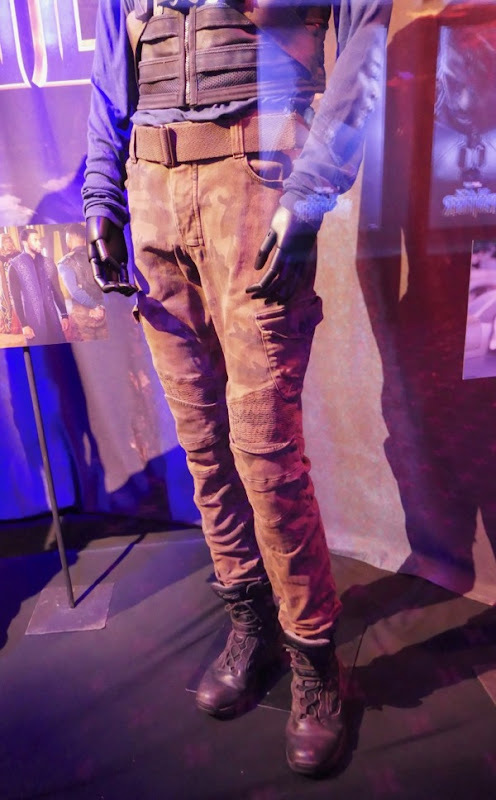 Stay tuned for even more looks from the movie in the days to come.